Proteomics is the term used for the large-scale analysis of proteins in biological fluids or cells by biochemical methods. Two approaches are used for proteomics analysis: two-dimensional polyacrylamide gel electrophoresis (2D-PA GE) and a mass-spectrometry-based approach, such as surface-enhanced laser desorption ionization (SELDI). SELDI can be used for large protein profiling or peptide identification after enzymatic digestion. In pancreatic cancer, proteomics analysis can be performed with the aim to identify all differentially expressed proteins in cancer cells vs normal pancreatic cells. Protein profiling of pancreatic juice or serum may also identify biomarkers for pancreatic cancer that could be used as diagnostic markers or therapeutic targets. 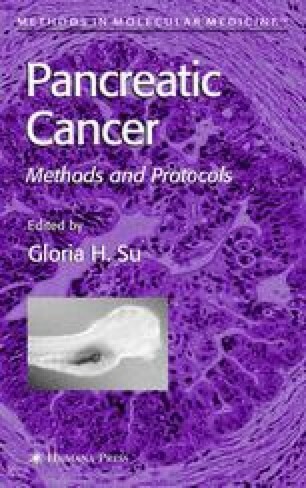 This chapter outlines the use of 2D-PAGE and SELDI for profiling the protein content of pancreatic juice samples and for identifying proteins differentially expressed in pancreatic cancer patient samples compared to control patient samples.